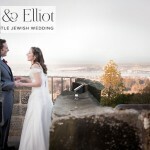 We wanted to give an order of service that explained all the elements of the ceremony as there were lots of guests attending that had never been to a Jewish wedding before. The Rabbi we used was Rabbi Paul Glantz . He’s a teacher but studied to be a Rabbi and is not affiliated with any shul which is why he is able to do interfaith ceremonies. 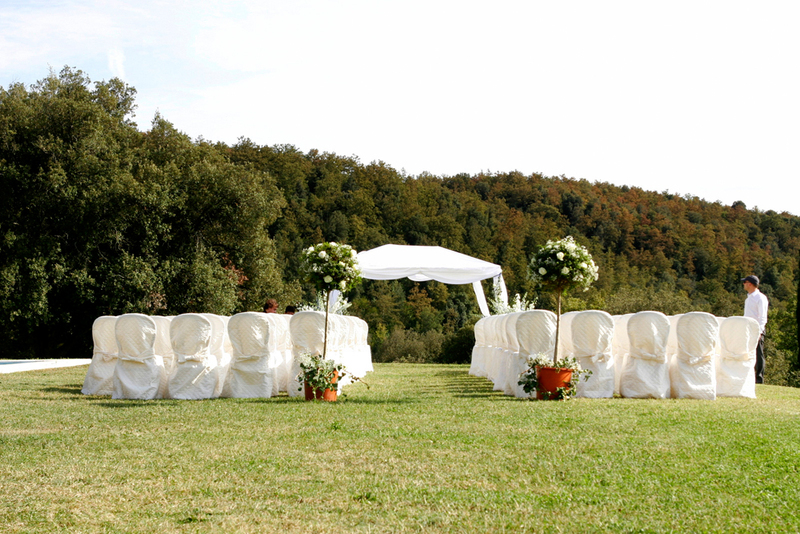 We had quite a lot of trouble finding a Rabbi to marry us and the ceremony itself was actually only a blessing, as in Italy you can only officially get married in church, synagogue or town hall and I wanted to get married out in the open air. 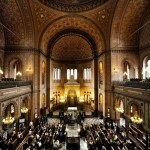 Additionally in Italy they only have Orthodox synagogues so we decided to fly Rabbi Paul over from London. He was really good and made the ceremony really personal. 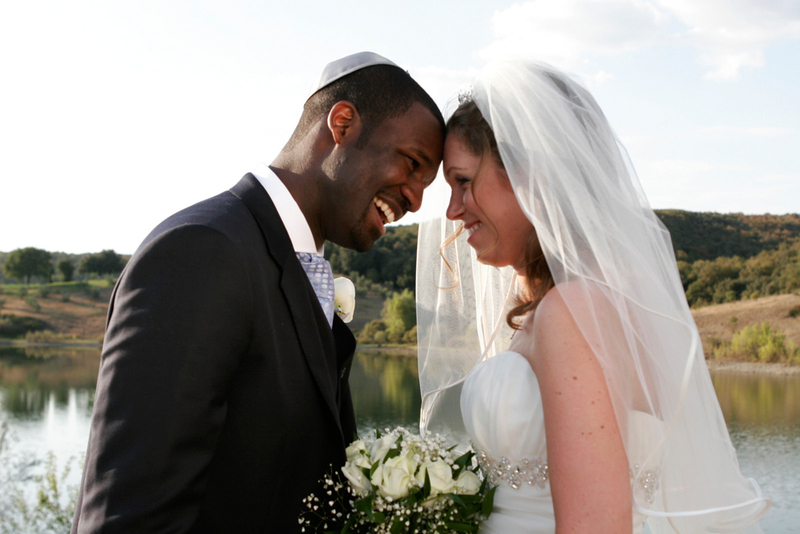 We spoke to various reform or liberal synagogues who agreed to carry out the ceremony but lots of the Jewish aspects of the ceremony were not allowed to be performed and we wanted the whole deal so we went with Rabbi Paul and were really happy with our choice. 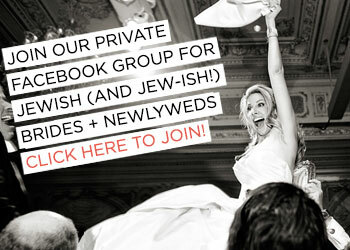 I think my favourite part of the ceremony was putting the rings on, and smashing the glass… MAZEL TOV!! I was quite pleased to get to the end of it as I was completely overwhelmed with the emotion of it all! In terms of the chuppah, normally that is organised or designed by the florist or synagogue, but as we were using our own flowers, we had no-one to provide this for us, and the venue had no idea how to do it either, so it was a bit of an issue! In the end Godwin bought a gazebo over from England which he built by one of the pools and it was then decorated with tulle material and pretty flowers. 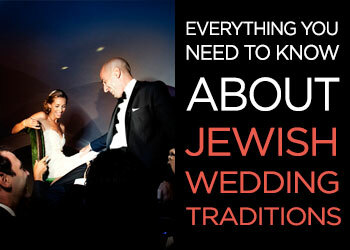 There were lots of blue ribbons too and the friends that were doing the flowers for us also decorated the chuppah. 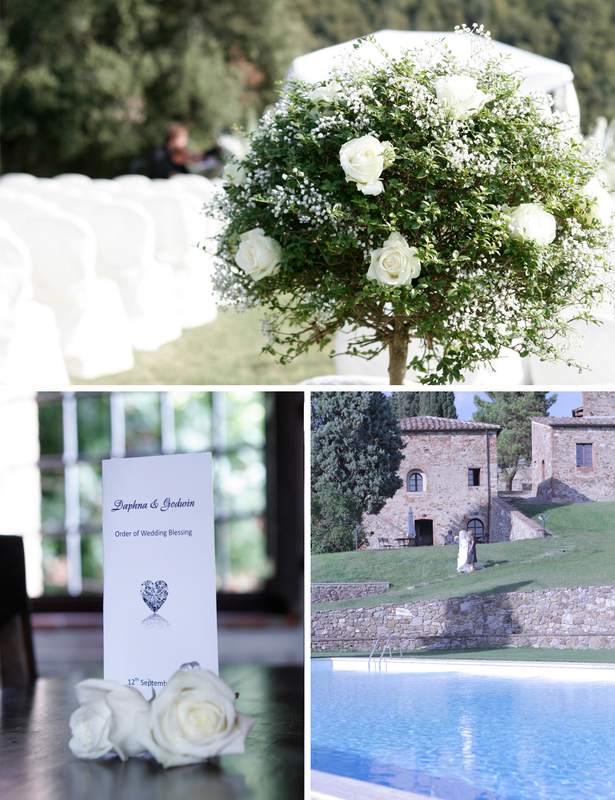 We had a string quartet called Firenze Classica before and during the ceremony that the venue recommended to us. Originally I wanted a harp but they said it would be too quiet for an outside wedding, the sound would get drowned out, so we went for string quartet instead. 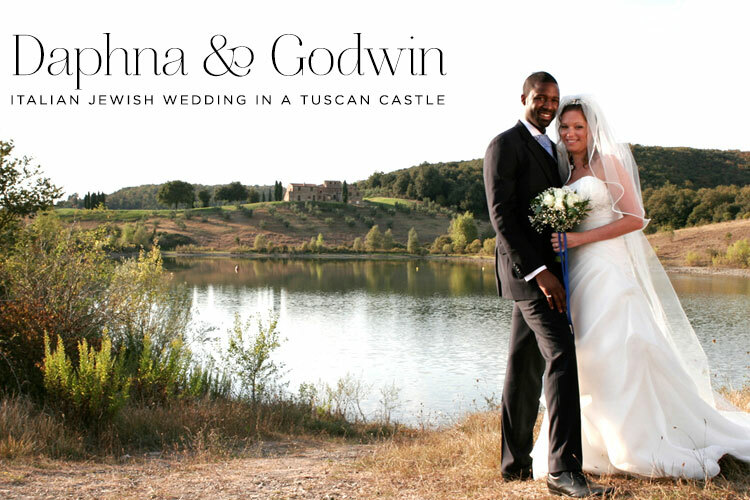 Godwin walked down the aisle to the James Bond theme tune, because he’s thinks he’s James Bond. He initially wanted to jump out of a helicopter to the ceremony, but due to the airspace being run by local military, he was not able to fly in. I walked down to Pachelbel Canon in D as I wanted something traditional. 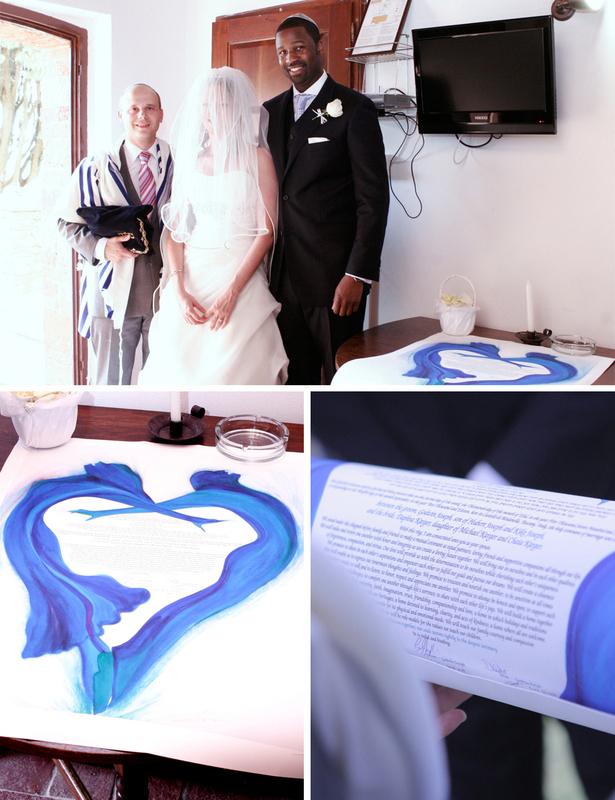 We ordered our ketubah from America, as in the UK they do not make them for interfaith weddings. 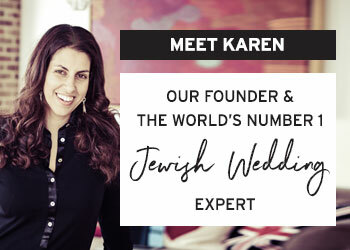 We found a website called 1800Ketubah that had lots of gorgeous designs, as well as lots of different texts to choose from. It arrived within one week of ordering, and we were really happy with the result. 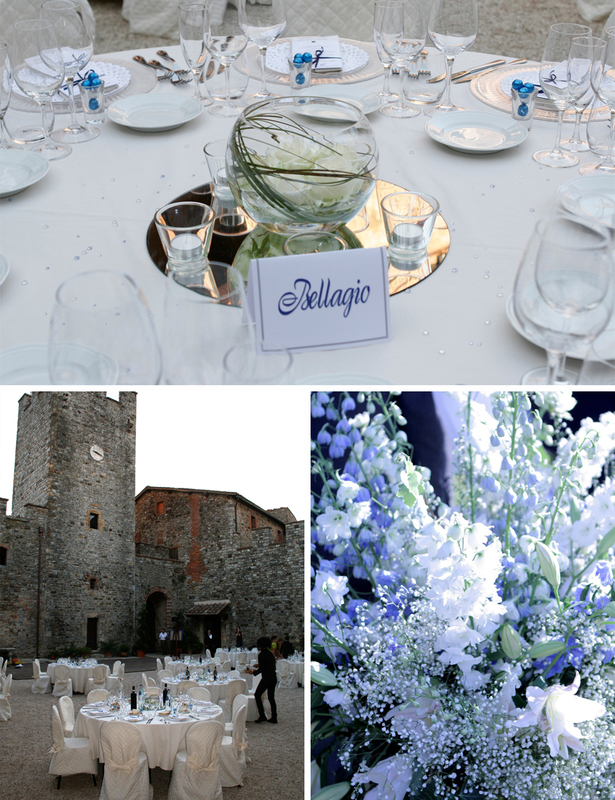 Heidi, a family friend who owns the castle, did the flowers for us (she does all her church flowers) along with Michal, my step sister, who is trained in floristry and landscape gardening. It was so nice having friends help us with our wedding – they did the flowers, bouquets and decorated the chuppah and did a really fantastic job. Our theme was blue and silver, but apparently none of the blue flowers were in season, and I didn’t want to use dyed flowers, so we went with white roses for the bouquets. 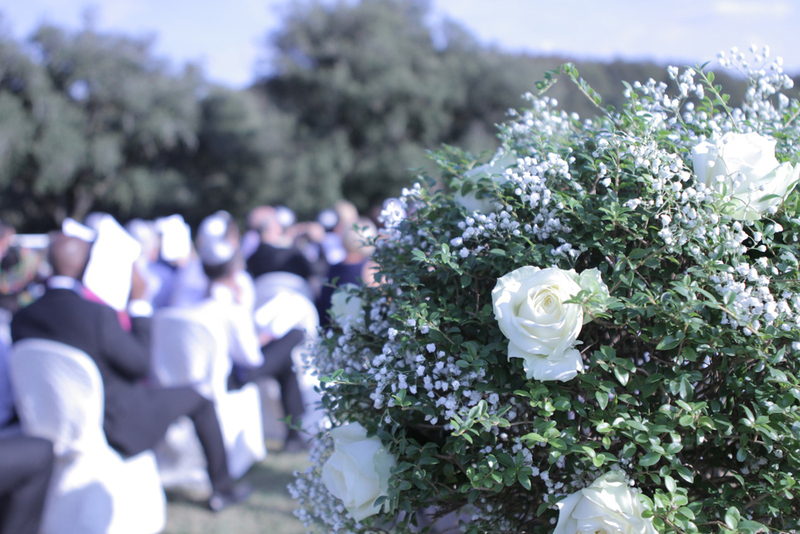 I had lots of blue and silver ribbons on the bouquet to fit in with my theme, and I really wanted lots of rose petals going down the aisle, but in the end it was too windy to put them down, they would have just blown away. Never mind, these things happen. I had two flower girls (my nieces) that spread some rose petals as they walked down the aisle, which was incredibly cute! 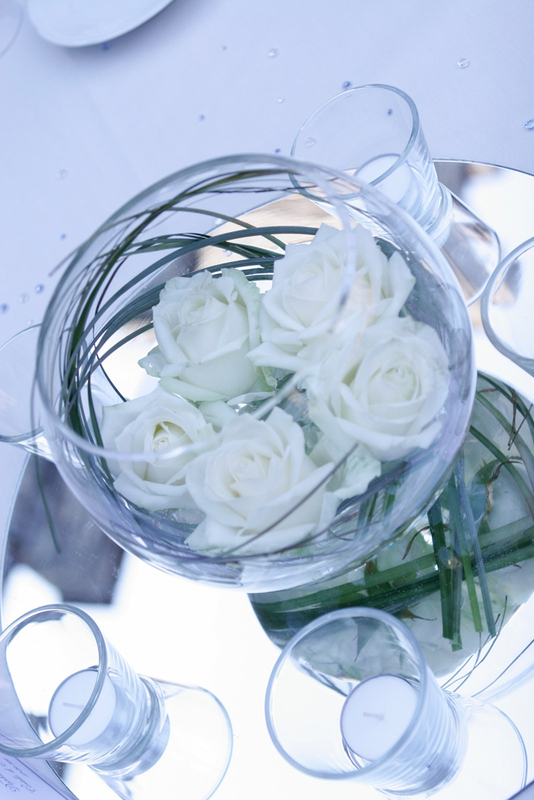 For the table centres we wanted something clean and simple so we went with a floating rose in a glass bowl, with candles all around. 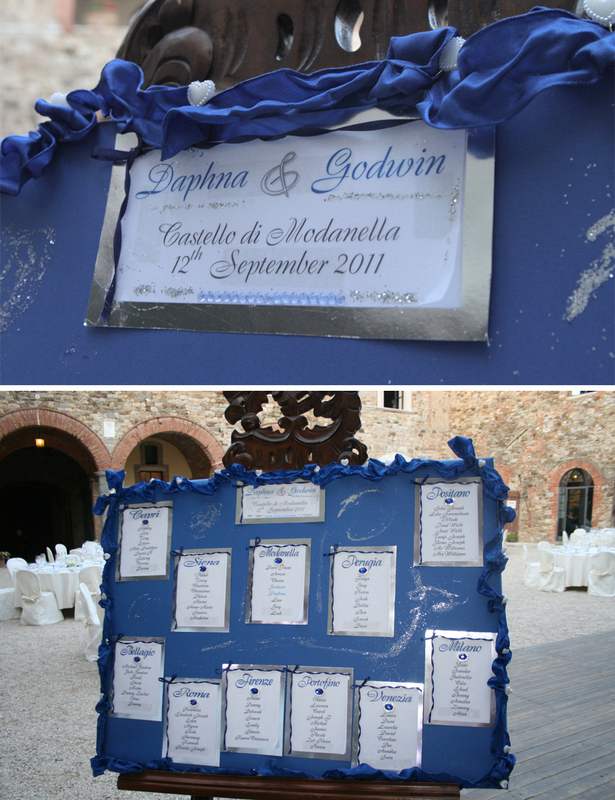 We also had some table diamonds just to add a bit of sparkle and named our tables after Italian cities. The catering was provided by the venue, where they have their own on site restaurant, which has some of the best food I have ever tasted! 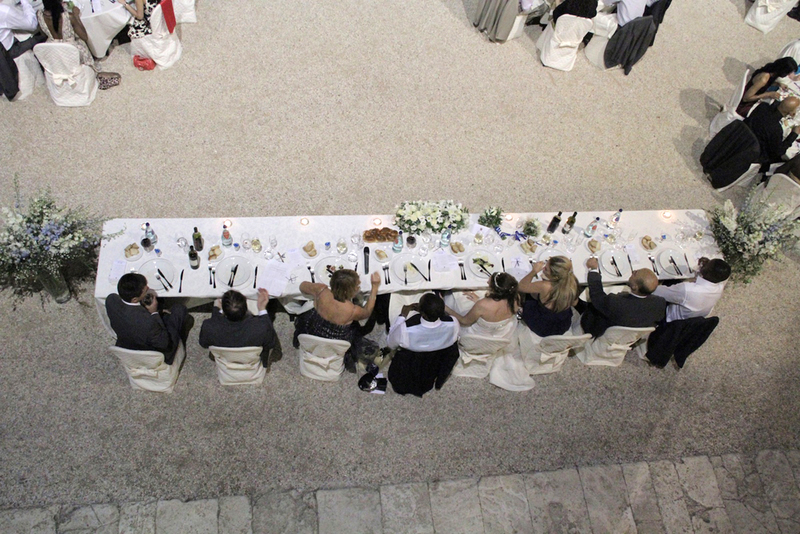 The wedding food surpassed our expectations, it was absolutely stunning and one of the best parts of the wedding. 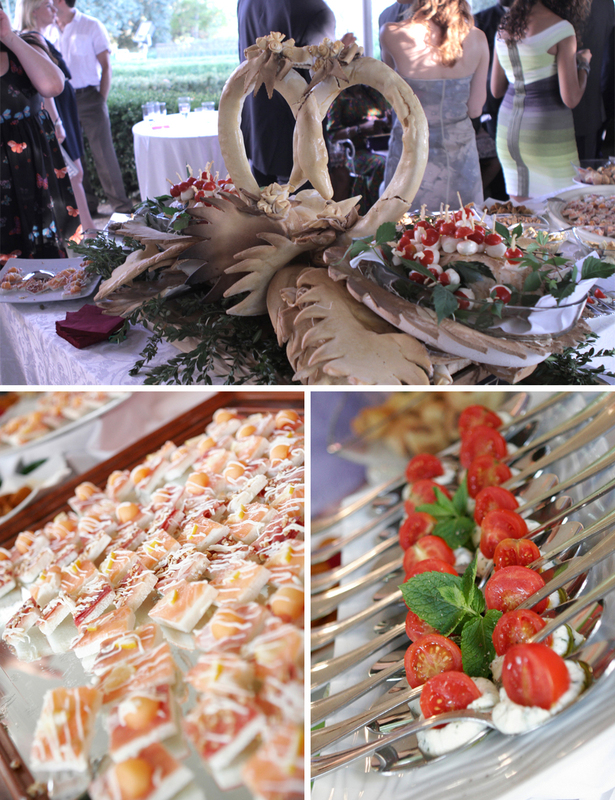 The reception food looked absolutely amazing, with swan bread designs and lots of typical Italian treats. For the main meal, there were five courses and after each course, the waiters went round and offered seconds to everyone, I don’t think anyone could have gone hungry! After doing menu tasting when I went to visit the site in April, the quality of the food was one thing I really did not have to worry about. For the guest book, we decided to use a polaroid camera where we could stick the photos in the book in the night, and then guests could write a message next to their picture. The photographers went round each table taking photos with the polaroid, and then putting them in the guest book. It was a really nice touch, and is a nice thing to look back on. 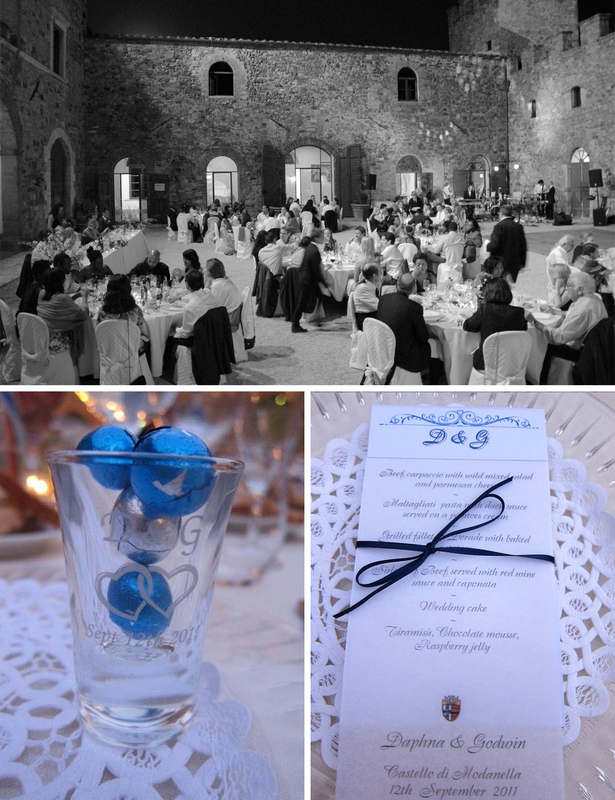 We had shot glasses made with our initials (D & G), and some interlinking hearts, which were then filled with blue and silver chocolates. We were very careful not to violate any copyright infringement with D & G Dolce & Gabbana! We enlisted the help of many of our guests to bring these over from London as they were pretty heavy! Many of the guests didn’t realise the glasses were for them to keep, so we had to make sure they knew this by the end of the night as we didn’t want to be left with 100 shot glasses! 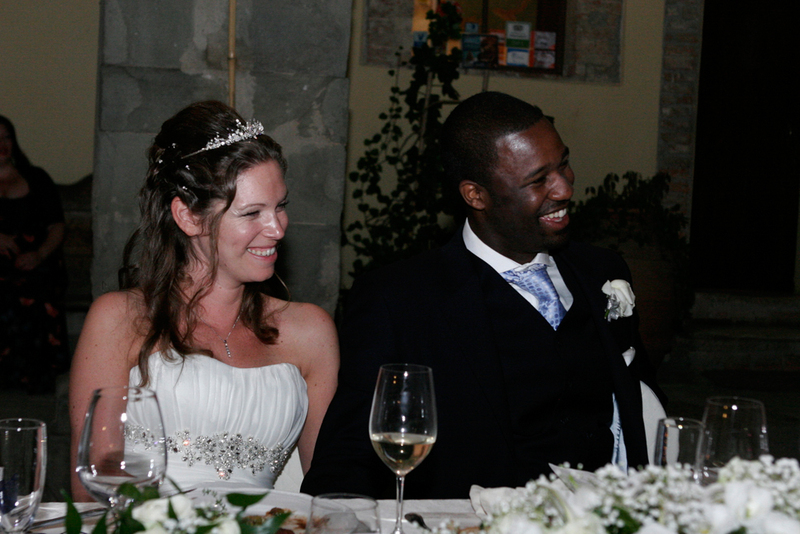 Music was one of the most important factors in our wedding along with plenty of food and drink. We wanted to make sure we had a good band that played good music to get everyone dancing so we brought the Black Hat Band over from England, who were brilliant. 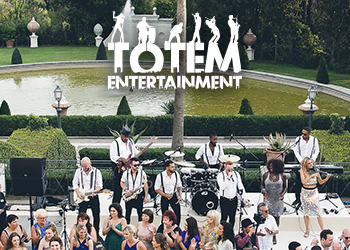 We had seen them at another friend’s wedding the year before and they really got the party going, so we wanted the same. They even learnt a few Jewish songs for us. 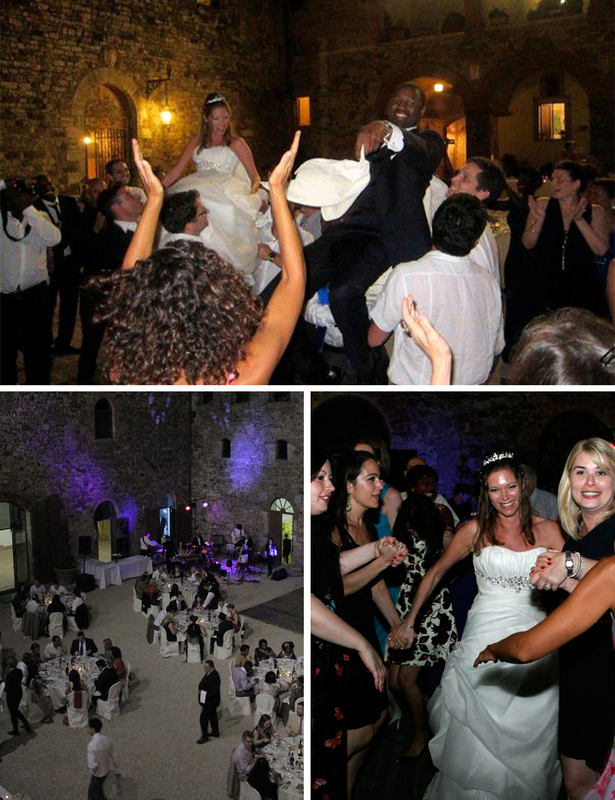 We love Motown songs so they played lots of those and also modern songs, they have massive repertoire to choose from. They were really lively and fun. During the reception they also played some jazz, before dinner. I think for me, the dancing was my favourite part of the day as that is the first point I could properly relax. With all the stress and organisation of the day, it was the point where I didn’t have to think about anything anymore – everything had gone smoothly and there was nothing left but to enjoy ourselves. Our first dance was to Ray Charles’ Hallelujah I love Her So. This is a song that Godwin always used to sing to me, so it had personal meaning to us. 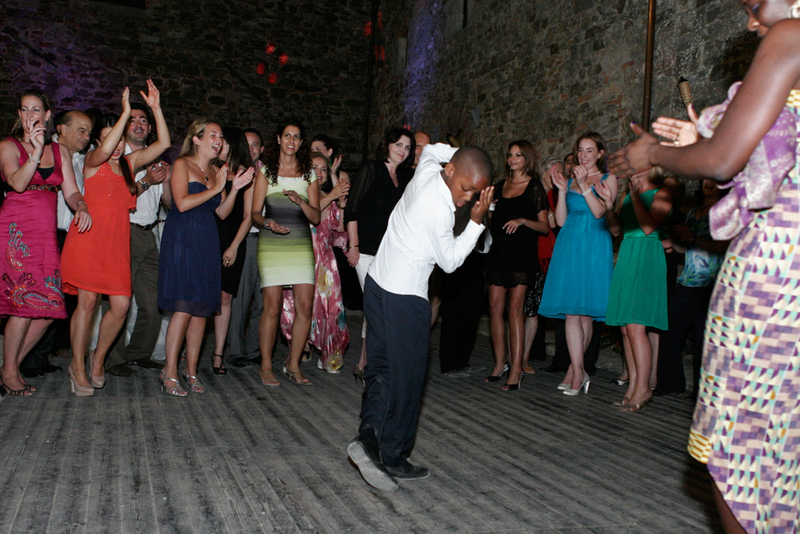 Later on Godwin’s 11 year old cousin stormed the dance floor with some brilliant moves. He really was a mini Michael Jackson, and I loved it! The rest of the guests also did the Electric Slide which was brilliant, I tried to keep up with it, but had no idea what I was doing! I found my dress, by an American designer called called Impression Bridal, in a small little boutique in a back street in Angel, Islington called Angelica Bridal. They were really friendly and helpful, unlike some of the other shops I tried. It was the third shop I went to, and whilst I liked lots of dresses I tried on, this was the one that was on my mind the most when I left the shop. I wanted something with sparkle but not too blingy, and it had to be something not too heavy as I was getting married in the heat. The dress I found was really lightweight so it was perfect, I loved it! Our photographers were friends of Godwin’s. We used two photographers to ensure that we captured all the angles and situations of the day. They arrived the night before, which meant they were able to take pictures during the BBQ we put on for guests and it was wonderful that the whole weekend was captured. The venue recommended a lady called Consuelo who is a make up artist and does Milan Fashion Week, but also does hair, and she was lovely. 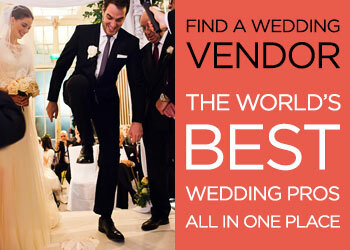 I had a trial in April, when I went over 5 months before the wedding to check out the venue and do food tastings etc. Try and take a step back during the day and just take everything in, as the day goes so quickly, it all seems like a blur and then it’s over! And try not to stress about the little things, there are bound to be a few little things that don’t go exactly according to plan but in the grand scheme of things it doesn’t matter as you won’t remember it in the long run, you’ll only remember what a fantastic day you had! If you don’t have a wedding planner, make sure you have someone that is in charge of running things on the day, or at least an MC to tell people what to do and where to go, as we didn’t have this and it would have been far less stressful! 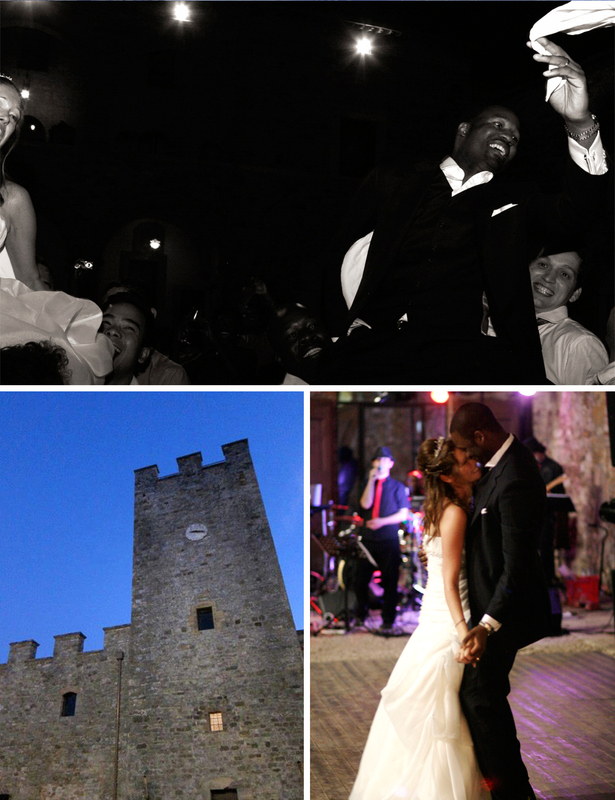 What a party, and what a lot of detail and thought went into this unbelievable wedding weekend! 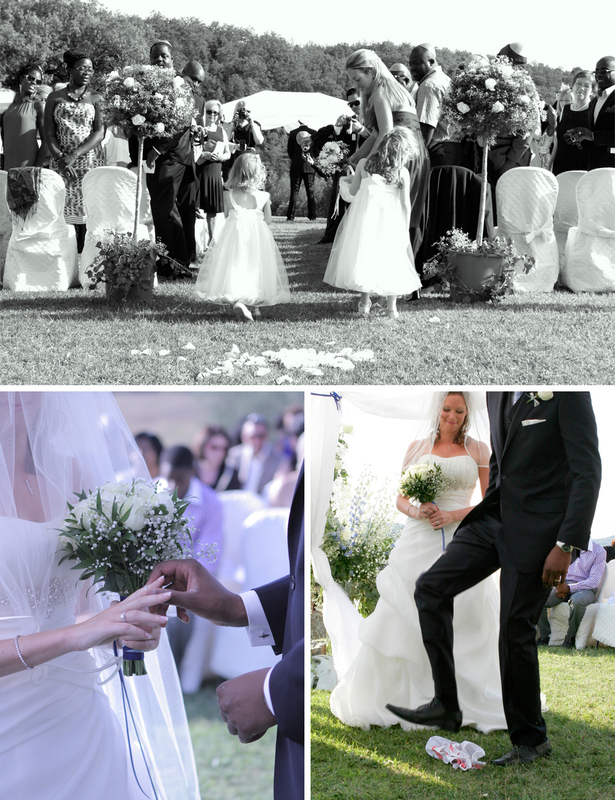 Certainly making your wedding day into a holiday is one of the best ideas ever. 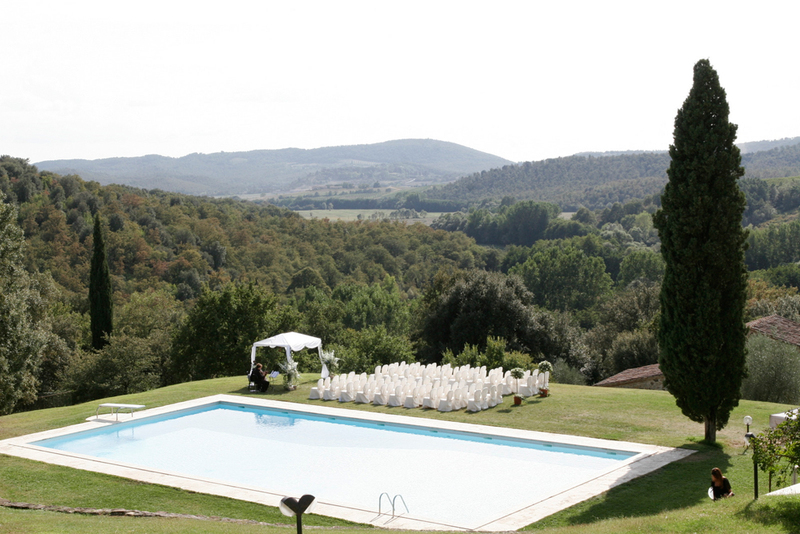 Not only do you get to throw a massive party for all your loved ones, but you also get to do it in a place where the weather stands a better chance of behaving on the big day! 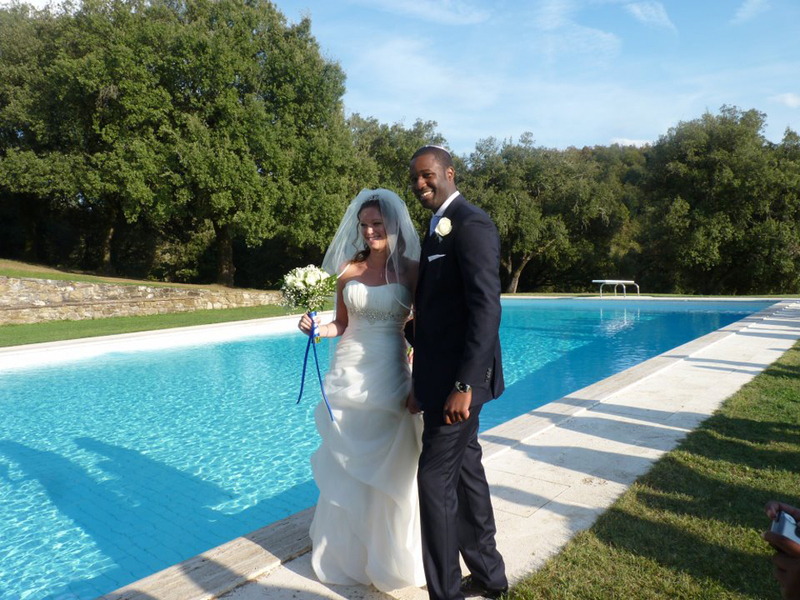 Thank you to the fabulous Daphna and Godwin for sharing their wonderful destination wedding with us.